Spots on both leaves and stems can be seen in this image. 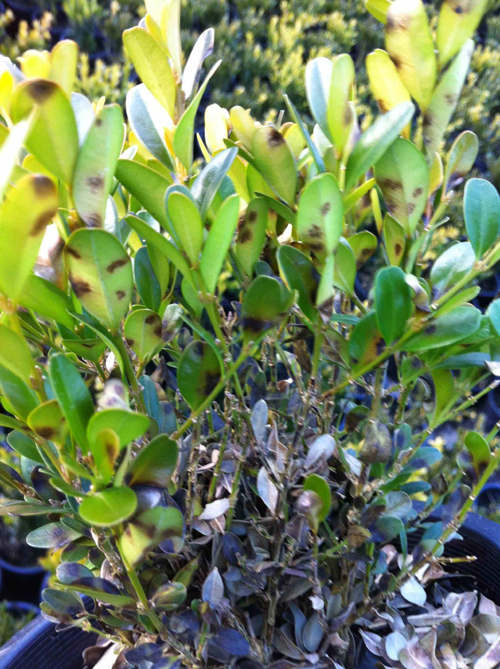 Whole leaves and stems can become blighted as on this 'Green Velvet' boxwood. OSU Plant Clinic Image, 2013. Dark or light brown spots on leaves, often in a circular or zonate pattern. OSU Plant Clinic Image, 2014. Lesions of various shapes on the leaves. Karl Puls, Oregon Department of Agriculture, 2011. Stem on the right has easy to see stem lesions and defoliation. Karl Puls, Oregon Department of Agriculture, 2012. Cause The fungus Calonectria pseudonaviculata (synonyms Cylindrocladium pseudonaviculatum or C. buxicola) was found for the first time late in 2011 in only three Oregon nurseries and four in British Columbia. Eradication efforts were initiated but have not been completely successful. The disease has been found in several Oregon nurseries (Wasington, Linn, and Marion counties) but also in landscapes in Clackamas, Multnomah, and Coos counties and in Seattle, WA. It has also been found in numerous nurseries and landscapes in Eastern North America. It has been a problem for many years in Europe and New Zealand. Calonectria henricotiea is an important species found only in Europe that is resistant to many fungicides. The disease is especially severe where plants are sheared tightly and/or planted in hedges. 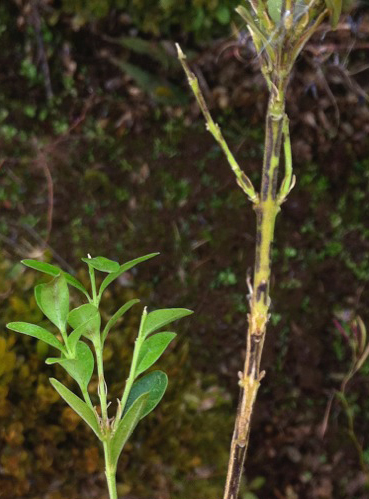 Due to the history of this disease, its explosive life cycle, and low level in tolerant plants, it is expected to be an ever-increasing problem throughout the PNW. Hosts include many Buxus spp. and cultivars, Pachysandra, and Sarcococca. The three main boxwood species-Buxus sempervirens, B. microphylla (littleleaf boxwood), and B. sinica var. insularis (Korean boxwood)-are known hosts. Buxus colchica and B. microphylla var. japonica (Japanese boxwood) are also hosts. There are no resistant cultivars; however, tests in North Carolina have found B. sinica var. insularis 'Nana' and B. microphylla var. japonica 'Green Beauty' to be tolerant although they still carry the fungus. The fungus can survive in fallen leaves for up to 5 years and can produce spores in a sticky, slimy matrix when environmental conditions become suitable. Mild wet weather west of the Cascade Range is conducive for long-term survival and infection. Microsclerotia (long-lived survival structures) are formed within infected tissue, released into the soil when the tissues breaks down, and subsequently initiate new infections when splashed onto foliage. Infection can occur very quickly in warm (64°F to 77°F), wet conditions. High humidity levels or free water are needed in order for infection to occur. No infections occur below 43°F. Only young leaves became infected at 54°F but need to be wet for 48 hours. Dry breaks of 3 hours or more during wet periods resulted in less disease development. The fungus can penetrate the leaf through the cuticle or enter through leaf stomata. New lesions and spores can be produced within a single week under favorable conditions. Short-distance dispersal occurs through water or rain splash (especially wind-driven rain) and human activities such as pruning. Long-distance dispersal can occur through the transport of infected nursery stock or infected plant debris. Spores are unlikely to travel long distances by wind alone. Younger leaves of 'Justin Brouwers' and 'Nana' are more susceptible than older leaves but younger leaves of 'John Baldwin' were less susceptible than older leaves. Volutella blight, often colonizes diseased stems associated with this disease. Symptoms Dark or light brown spots on leaves, often in a circular or zonate pattern, black streaks or cankers on stems, straw- to bronze-colored blighted foliage, and defoliation. 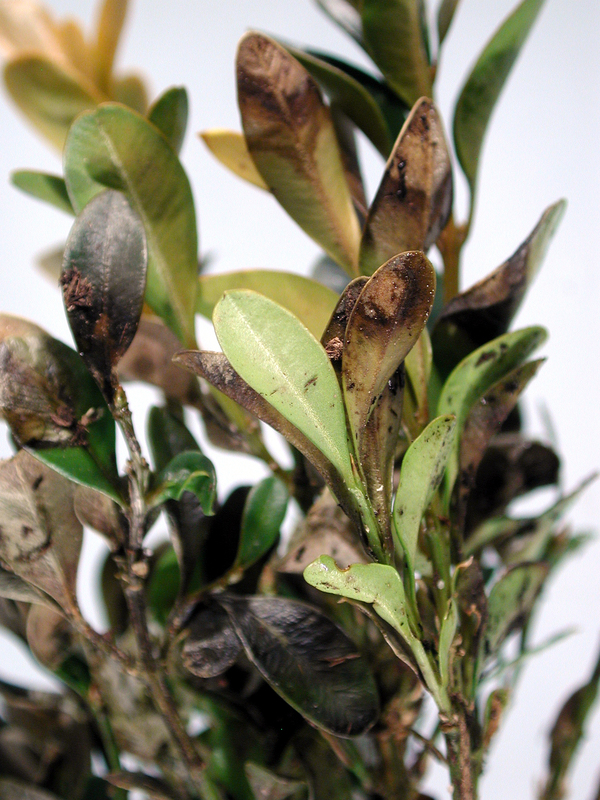 Blighting and defoliation can occur suddenly, with complete leaf loss in severe cases. Leaf spots can grow together to cover the entire leaf surface. 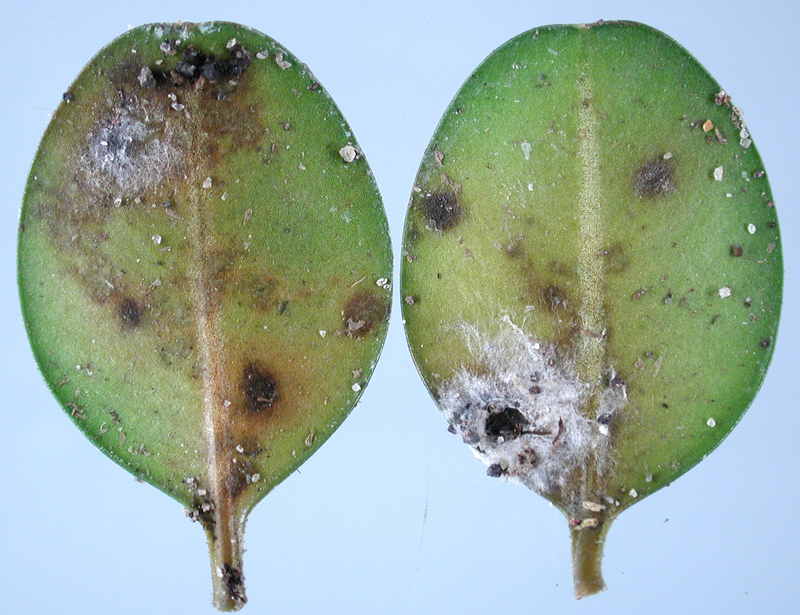 Downy white fungal growth may be seen on the underside of leaves. Tufts of white spores (sporodochia) may be seen along lesions. Heavily infected plants may lose leaves from the bottom of the canopy first leaving stems with a "lion tail" look. Propagation flats may have more blight toward the center than the margin of the flat. Infected stems can have multiple diagnostic dark-brown or black lesions, either linear or diamond-shaped. The black streaks found on stems progress from the bottom of the plant up. New growth continues to develop on healthy stems, and often the root systems remain healthy and intact. Young seedlings, however, may die from this disease. Fall and winter are the best times of the year to look for the disease especially after significant rainfall. Spores of the pathogen can sometimes be seen on the underside of the infected leaves. Under high humidity, white fuzzy masses comprised of large numbers of spores are sometimes visible to the naked eye or with a hand lens on infected stem and leaf tissue. Scouting Inspect the lower and interior canopy for symptoms of the disease. It may not be found unless the canopy is parted and interior leaves and stems are examined for spots and streaks. Cultural control To limit spread and movement of the pathogen, all confirmed infected plants should be destroyed. Isolate and contain new shipments of boxwood for a 30-day observation period. Locate the isolation area well away from existing blocks or outgoing shipments, and scout weekly. 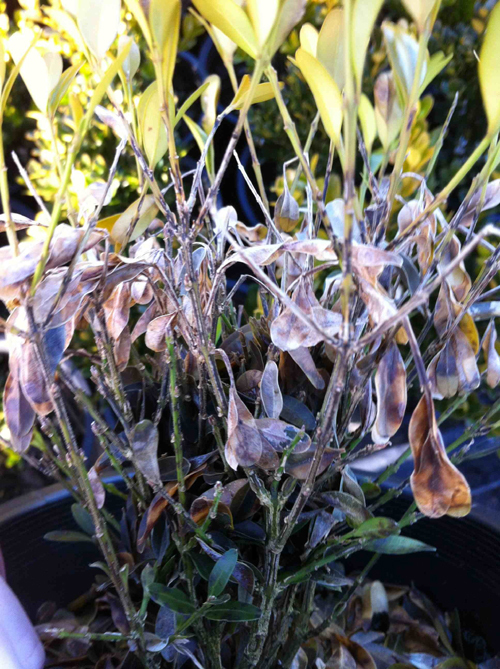 Break up large blocks of Buxus with non-host species to limit exposure and potential losses due to this disease. Do not reuse or recycle or compost infected plants, media, or containers. Professional composting is fine. Scout all plants on a weekly basis, especially just after warm, wet weather. Limit activity in plantings during rainy and/or wet weather. Remove and destroy dead leaves and plant debris from within and underneath plants. Flaming was only partially successful in reducing inoculum from under contaminated plants in Virginia. Also, prune off and destroy infected twigs. Do not grow susceptible plants on ground that has been positive for this disease. Disinfest pruning equipment, especially between blocks of plants. Labeled rates of bleach, Lysol, Oxidate, and X3 have been effective as well as 40-70% ethanol. Disinfestants work better on clean equipment with long contact times. Space and prune (thin) plants for good air circulation. Thinning is best done in the fall during dry weather using sharp bypass pruners. Grow tolerant species or cultivars but exercise caution to avoid inadvertently bringing in or shipping out infected plants. Grow plants in well-drained media or soil with a pH between 6.8 and 7.5. Light shade of 20% can also reduce injury from summer and winter extremes. Mulching with composted pine bark has helped reduce transmission to healthy plants. Under severe landscape situations in Europe, Japanese holly (Ilex crenata) has been recommended as an alternative plant. Chemical control Combine fungicide use with intensive scouting and cultural management. Curative applications will not effectively manage this disease even with the best products. Alternate or tank-mix products from different groups that have different modes of action. Use of tank-mixes or pre-packed mixes are preferred, especially using a multisite fungicide as one component of the mix. Test for phytotoxicity on a small group of plants or cultivars before widespread use, especially if surfactants are included in the mix. High rates of Group 3 materials may cause some marginal burning of leaves. Good coverage is essential but difficult to achieve with dense foliage. Dilute high-volume applications will provide better coverage than low-volume concentrate applications. Reduced sensitivity to Group 11 fungicides is suspected in Northeast America. Weather data combined with disease modeling has indicated that many infections can occur on young growth in spring during rainy weather. The potential for fall infections of older leaves is also possible when rain returns in the autumn. Focus applications in the spring beginning at bud break and continuing with wet weather. Monitor weather in the fall and apply a fungicide if warm and wet weather is forecasted. There are no fungicides in small, home packaging labeled for this disease. It is suggested that homeowners hire a reputable landscape company for management of high vale hedges and landscapes. Both cultural and chemical tactics must be used. Affirm WDG at 0.25 to 0.5 lb/100 gal water. Not as effective alone. For use in greenhouse or hoop house (or similar structures) only. Boxwood is not on the label but may legally be used. Test first on a small section before applying on the whole plant to evaluate possible phytotoxicity. Group 19 fungicide. 4-hr reentry. Banner MAXX at 6 to 8 oz/100 gal water. Can be used in the landscape and many other sites. Boxwood is not on the label but may legally be used. Test first on a small section before applying on the whole plant to evaluate possible phytotoxicity. Group 3 fungicide. 24-hr reentry. Cleary's 3336 EG at 12 to 16 oz/100 gal water plus another fungicide from another fungicide group. Boxwood is NOT specifically mentioned on the label but may legally be used. Inconsistent control. Can be used in the landscape and many other sites. Group 1 fungicide. 12-hr reentry. Compass O 50 WDG at 1 to 4 oz/100 gal water. Do not use organosilicate additives. Boxwood is NOT specifically mentioned on the label but may legally be used. For use in nurseries, greenhouses, hoop houses, or similar structures. Group 11 fungicide. 12-hr reentry. Concert at 26 to 35 fl oz/100 gal water. Good control. Landscape use only. Might leave a slight residue on leaves and/or slight plant growth regulation effect. For use in nurseries and landscapes. Group 3 + M5 fungicide. 12-hr reentry. Daconil Weather Stik at 1.4 pints/100 gal water. Do not use with a surfactant. Good control. Can be used in the landscape and many other sites. Boxwood is not on the label but may legally be used. Test first on a small section before applying on the whole plant to evaluate possible phyto-toxicity. Group M5 fungicide. 12-hr reentry. Eagle 20 EW at 6 to 12 fl oz/100 gal water. Can be used in the landscape and many other sites. Boxwood is not on the label but may legally be used. Test first on a small section before applying on the whole plant to evaluate possible phytotoxicity. Group 3 fungicide. 24-hr reentry. Emblem at 2 to 4 fl oz/100 gal water. Use with oils or adjuvants may cause plant damage. Can be used in the landscape and many other sites. Group 12 fungicide. 12-hr reentry. Heritage at 4 to 8 oz/100 gal water plus a non-silicone-based wetter sticker. Can be used in the landscape and many other sites. Group 11 fungicide. 4-hr reentry. Insignia SC at 3 to 12 fl oz/100 gal water. Do not use with organosilicate-based adjuvants. Mediocre to fair control. Can be used in the landscape and many other sites. Group 11 fungicide. 12-hr reentry. Mancozeb-based products for nursery and greenhouse use. Group M3 fungicides. 24-hr reentry. Fore 80 WP at 1.5 lb/100 gal water plus a spreader-sticker. Do not use on pachysandra. Protect DF at 1 to 2 lb/100 gal water plus 2 to 4 oz spreader-sticker. Can be used in the landscape. Medallion WDG at 1 to 4 oz/100 gal water. Use with oils or adjuvants may damage plant. Can be used in the landscape and many other sites. Boxwood is not on the label but may legally be used. Test first on a small section before applying on the whole plant to evaluate possible phytotoxicity. Group 12 fungicide. 12-hr reentry. Mural at 4 to 7 oz/100 gal water. Do not let drift contact apple, crabapple, or privet or damage could result. Can be used in commercial landscapes and many other sites. Boxwood is not on the label but may legally be used. Test first on a small section before applying on the whole plant to evaluate possible phytotoxicity. Group 7 + 11 fungicide. 12-hr reentry. Orkestra at 8 fl oz/100 gal water. Can be used in the landscape and many other sites. Group 7 + 11 fungicide. 12-hr reentry. Pageant at 8 to 12 oz/100 gal water. Do not use more than two (2) consecutive applications before switching to a different fungicide group. Mediocre to good control. Can be used in the landscape and many other sites. Group 7 + 11 fungicide. 12-hr reentry. Palladium at 2 to 4 oz/100 gal water. Avoid excessive runoff to small plants, which may result in stunting and/or chlorosis. Can be used in commercial (not residential) landscapes and many other sites. Boxwood is not on the label but may legally be used. Test first on a small section before applying on the whole plant to evaluate possible phytotoxicity. Group 9 + 12 fungicide. 12-hr reentry. ProCon-Z at 5 to 8 oz/100 gal water. Can be used in the landscape and many other sites. Boxwood is not on the label but may legally be used. Test first on a small section before applying on the whole plant to evaluate possible phytotoxicity. Group 3 fungicide. 24-hr reentry. Spectro 90 WDG at 1 to 2 lb/100 gal water. Many turf sites need to be avoided. Boxwood is not on the label but may legally be used. Test first on a small section before applying on the whole plant to evaluate possible phytotoxicity. Group 1 + M5 fungicide. Good control. 12-hr reentry. Spirato GHN at 2 to 4 fl oz/100 gal water. Use with oils or adjuvants may cause plant damage. Can be used in the landscape and many other sites. Group 12 fungicide. 12-hr reentry. Torque at 4 to 10 fl oz/100 gal water. For use in landscapes and container grown ornamentals. Boxwood is not on the label but may legally be used. Test first on a small section before applying on the whole plant to evaluate possible phytotoxicity. Group 3 fungicide. 12-hr reentry. References Avenot, H.F., King, C., Edwards, T.P., Baudoin, A. and Hong, C.X. 2017. 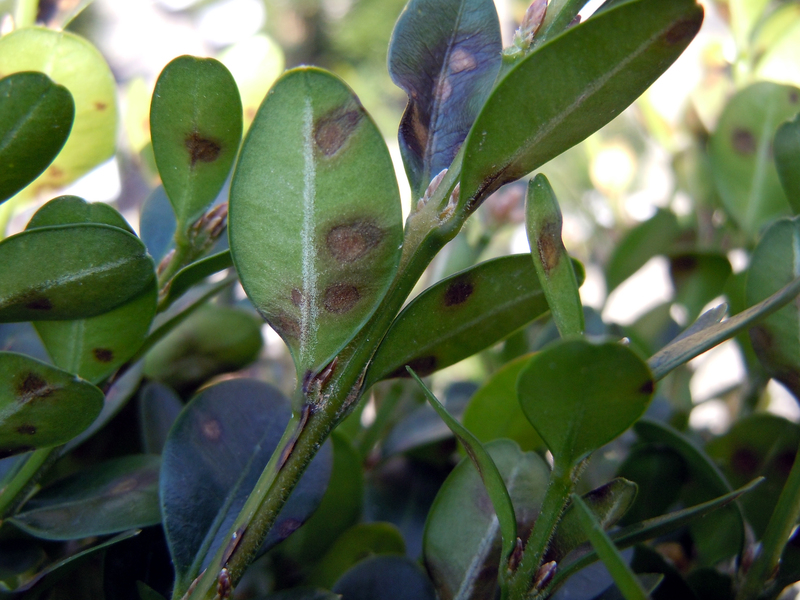 Effects of Inoculum Dose, Temperature, Cultivar, and Interrupted Leaf Wetness Period on Infection of Boxwood by Calonectria pseudonaviculata. Plant Disease 101:866-873. LaMondia, J. A. 2015. Management of Calonectria pseudonaviculata in boxwood with fungicides and less susceptible host species and varieties. Plant Disease. 99:363-369. Shishkoff, N., and Camp, M.J. 2016. The effect of different temperatures and moisture levels on survival of Calonectria pseudonaviculata in boxwood leaves and twigs and as microsclerotia produced in culture. Plant Disease 100:2018-2024.